Do Different Brands of Baby Cereal Provide the Same Nutrition? Although there are some similarities, there appears to be more differences between different brands of baby cereal products, even between different brand products of the same type of cereal. How so? Read on. Generally all infant cereals are fortified in certain nutrients such as iron, thiamine, riboflavin and niacin. Baby cereal products also contain (per serving) similar amounts of macronutrients such as calories, carbohydrates, fats and protein. However, major differences exist. 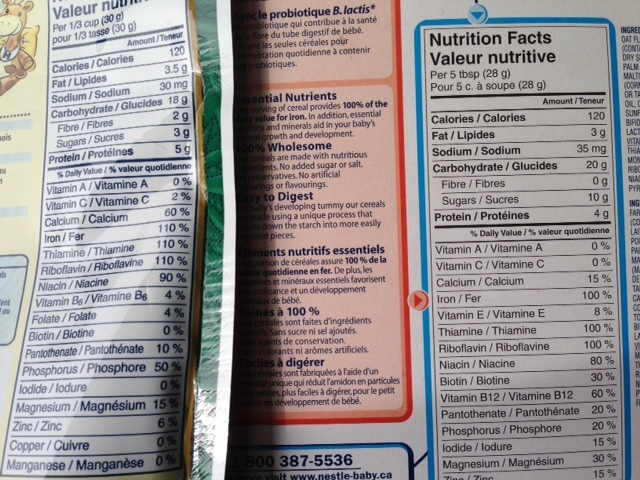 For example, in Canada, Nestle Gerber’s® baby oat infant cereal provides in a (5 tablespoons or 28 grams) serving the following: 15% Daily Value (DV) of calcium, 60% DV of vitamin B12, 100% DV of iron and 0 grams of fiber. But a comparable (1/3 cup or 30 grams) serving of Heinz’s baby oat cereal provides more iron (110% of DV iron), 4 times the amount of calcium (60% DV of calcium), 2 grams of fiber but absolutely no vitamin B12! Not only that, Nestle Gerber’s® baby oat infant cereal contains in a serving 30% DV of biotin, 15% DV of iodide, 15 % DV of zinc and 30% DV of magnesium. However, a similar serving size of Heinz’s baby oat cereal contains no biotin or iodide, only 6% DV of zinc and halfthe quantity of magnesium (15% DV)! It appears that Heinz’sbaby oat cereal is a really good source of iron and calcium per serving, but not so much of the other nutrients. For plant-based mums, be aware that though you would expect infant cereal to be vegan or vegetarian, that may not be the case. In fact, both the Nestle Gerber’s® baby oat infant cereal and Heinz’s baby oat cereal contain dry skim milk as part of the ingredients! So the next time you go shopping, make sure to check the nutrition facts panel of the infant baby cereal you are planning to buy, to see what nutrition your baby will really be getting from consuming that particular product!